Hello Friends! Today we will quickly list out 10 Gardening Tips to Increase Flowering in any plant whether Rose or Hibiscus. These tips are really easy to follow and you can maintain blooms throughout the year. That's Coming up. 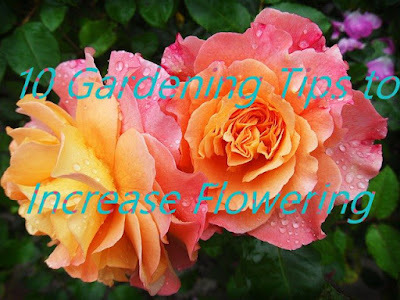 Well, Let's list out the 10 tips on increasing blooms: Always Remember one principle in gardening - the plant performs well when its free from stress. This is generally your first task as soon as you bring your plant home from a nursery. Do not report immediately, Allow your plant to settle for at least one week to its new environment. During repotting, you need to mix some important ingredients into the potting mix like for a 12-inch pot, roughly about 1 tablespoon of steamed bone meal powder. Optionally you can also mix the mycorrhizae fungi - the beneficial fungi or even pseudomonas and Trichoderma powder. The concept here is: if you choose a deeper container, it will focus more on root development and less on flower production. The best one is a container that is wider than the usual nursery pot, but still not too deep. This way you will make your plant strong and make it produce more flowers. Keep your plants away from traffic and pollution. Also in a location that is not disturbed by frequent movements from people or animals and even your pets. Place your plant in a location where you get adequate sunlight. At least 6 hours to 8 hours DIRECT SUNLIGHT is compulsory for flowering plants. If it is too hot like in summer, protect them from noon sunlight using a green shade net. If you are growing in containers, daily watering is must especially in summer season. Do not worry about over watering if are using a well-draining soil. Controlling pests is a very important step to keep the plant healthy and blooming. Examine the plant closely for pests and insects including the underside of the leaves. Common pests like whiteflies, aphids, mealybugs can be easily eliminated using neem oil + liquid soap in water. Or adding oils like Clove Oil or eucalyptus oil increases the efficacy. Use organic. If you don't know how to make organic pest. Click the link. click the link. This is another important step before applying any fertilizer or manure to your plant. Raking the soil is recommended once every 15 days. Make it a habit to rake the soil and then apply your fertilizer every 15 days. Here you should remember fa ew important points like a) PH of soil, b) How to make the best potting soil for flowering plants c) Keep the soil well draining. The First factor is PH. Plants like Rose and Hibiscus prefer slightly acidic soil like around 6 to 6.5. If you have a PH testing meter, you can accurately use this hack to use Alum powder to make your soil acidic. Even if you do not have this meter, you can roughly add about 5 to 10 gms of alum powder in one liter of water once every 15 days to maintain this acidic level, which is very important for absorption of nutrients you add to your plant. You can also use 1 to 2 teaspoons of white vinegar per liter of water to make your soil acidic. Now When you make a potting mix, you can add an extra 10 percent additional compost like decomposed cow dung powder. And also bone meal powder as discussed earlier. In this video, I will be talking only about organic fertilizers and not chemicals like NPK or DAP. Add a handful of decomposed horse dung or cow dung powder or vermicompost on the top layer of the soil once every 15 days after nicely raking the soil. This should be the minimum fertilizer use and frequency. You can also use compost tea sprays or even mustard cake tea and other foliar feeds if you want better results. What I use once every 15 days is My homemade organic fertilizer. Always try to use organic. Yes, this is a most important step which many of us neglect or some newbie gardeners think like its plant cruelty. But this is not the truth. Pruning or pinching and also deadheading of the flowers from time to time is the most important step for maintaining blooms. Generally Pruning which is of two types Hard Pruning and Soft Pruning. Hard Pruning is done in early spring that's in Feb end or March beginning. If you missed that, No Worries! You can still perform Soft Pruning or Trimming. Trimming sparks new growths especially in rose bushes. So there you have it, folks, that was our episode on the 10 surefire ways to increase blooms.